Need new easy waffle recipes for breakfast? We’ve got the day all planned out, starting with these delicious Cream Cheese Waffles that you absolutely won’t want to miss. Now, if you’re lucky enough (like we have been this summer) to be able to pick fresh berries right from your backyard garden…you can go out and pick your favorite berries for this yummy recipe. That fresh flavor is totally worth it. Yesterday, we were out picking berries and veggies from the garden and our black lab sniffed out a bunny nest! Three adorable baby bunnies were just hanging out waiting for their mama bunny to come back at night and feed them. We’re keeping our dog away from that area and keeping a distant eye on the baby rabbits to make sure they are staying healthy so we know that their mom is coming back to take care of them. The babies were doing fine this morning. And if you like these waffles, you’ll probably adore our Elvis-Inspired Peanut Butter Banana Waffles, Very Berry Chocolate Chip Waffles, and Best Almond Poppy Seed Waffles Recipe. 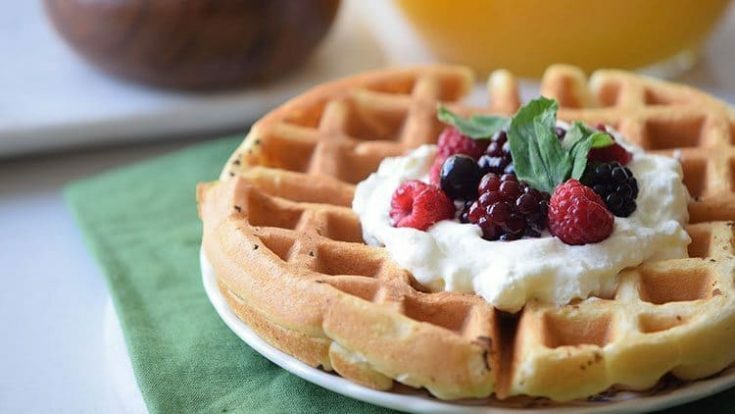 Think about it–when you have the perfect flavor of waffles, seasoned to perfection mind you, AND you have cream cheese and fresh berries–well, what more could you possibly ask for? Serve these waffles up family-style and watch everyone dive in and eat them up. What could possibly hold them back? Take a short reprieve from all the pumpkin recipes–and you better believe we’ve got our share of those too–and enjoy a last sweet breath of summer. And then, leap into the fall season with Pumpkin Dump Cake, Pumpkin Pancakes and Pumpkin Cream Cheese everything. In a bowl, beat together the cinnamon, eggs, flour, sugar, milk, baking powder, vanilla extract, and nutmeg. Pour batter into the waffle iron (preheated to medium heat). Serve with berries as a topping and enjoy. Cut the waffles into small triangles and serve them with different topping options for a waffle bar. « Why is Virginia Beach a Top Foodie Destination? Oh my goodness. These look so good.